For the second time in the past three seasons and the seventh time in program history, the Emory women's tennis team has captured the NCAA Division III National Championship. The Eagles rallied for the 5-4 come-from-behind victory to defeat Williams College on Wednesday afternoon at Stowe Stadium in Kalamazoo, Michigan. 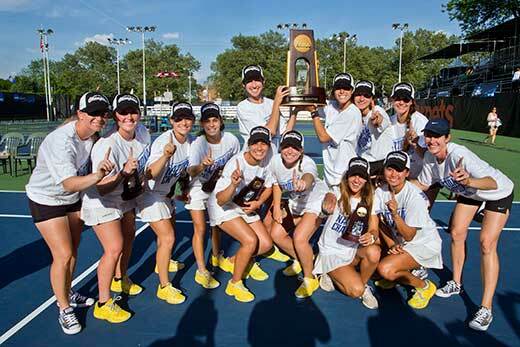 For the second time in the past three seasons and the seventh time in program history, the Emory University Women's Tennis team has captured the NCAA Division III National Championship. The Eagles rallied for the 5-4 come-from-behind victory to defeat Williams College on Wednesday afternoon at Stowe Stadium in Kalamazoo, Michigan. The Emory Women's Tennis program has now won the NCAA national championship in 1996, 2003, 2004, 2005, 2006, 2014 and 2016. It marks the 20th Division III national championship in the history of the Emory Athletics program, joining the women's swimming and diving title teams of 2005, 2006, 2010, 2011, 2012, 2013, 2014, 2015 and 2016; men's tennis NCAA championship teams in 2003, 2006 and 2012; and volleyball being crowned the 2008 Division III Champions. Emory trailed Williams 4-3 in the match before senior Madison Gordon and junior Michelle Satterfield claimed the final two points to seal the title for the Eagles. Gordon earned a decisive 7-5, 6-0 victory for fifth singles point that tied the score at 4-4. Just moments later, Satterfield broke serve at 4-3 in the second set of her match to move in front 5-3 before closing it out for the 6-2, 6-3 decision to give Emory the championship. The Eagles trailed 2-1 after doubles play as Williams College took the first two doubles points from Emory. Paula Castro and Satterfield were able to salvage the final doubles point as the duo won six of the final seven games in the match for the 8-5 triumph on court three. Castro opened singles action with a dominant showing for the Eagles at fourth singles over Julia Cancio, winning 6-3, 6-1, to tie the score at 2-2. Williams regained the lead at 3-2 as Linda Shin knocked off senior Beatrice Rosen 6-1, 6-0 in the No. 3 singles match. The teams went back to being deadlocked at three apiece as junior Katarina Su won in straight sets 6-2, 6-2 on court no. 6. Williams College picked up their fourth match win as Juli Raventos handed sophomore Bridget Harding a 6-1, 6-2 defeat at first singles to put Williams back in front 4-3. But the outcome of the final two remaining matches swung in favor of the Eagles as Gordon erased an early first set deficit en route to her 22nd straight singles match victory with Satterfield following shortly after with a never in doubt triumph at second singles for the clincher. Emory finishes the season with 28 wins, going 28-5 overall including a 22-1 mark against Division III opponents. The 28 victories ties the 2014 squad for the school record of most wins in a single season. Williams concludes its year with an overall record of 22-4 with two losses coming against the Eagles. Several Eagles will now compete in the Individual Championships, running from Thursday through Saturday in Kalamazoo, Michigan. Harding and Satterfield will represent Emory in the singles draw while Harding and Su will take part in the doubles competition. More information regarding the Individual Championships can be found here on the tournament webpage.